Love was very important to the Shakespearean audience. There is not a play written by Shakespeare that does not contain some form of a love relationship. 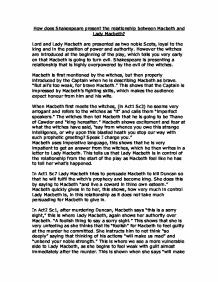 These plays usually end happily, however in the case of “Macbeth”, the relationship that carries this important function, that is love, is conveyed in a way most peculiar.